I’ve been fascinated with the idea of electronic books for a long time. I was an early adopter, buying a Rocket e-book reader about 10 years ago. It never really caught on. I knew an ebook reader from Amazon probably had the greatest chances of succeeding due to Amazon’s extensive connections with publishers. I bought the first version Kindle for almost $400. The electronic ink display really was almost like paper and the 3G connectivity made it ridiculously easy to buy and download books from Amazon. Compared to later Kindle versions the first unit looked more like a prototype than a finished product. I describe the sad loss of my first Kindle and my impressions of Kindle 2 here. Amazon recently announced the introduction of a new line of three Kindles. None of the models have physical keyboard, which I think is a big step backward. I don’t use the keyboard much for annotating, but it comes in handy for entering search terms. 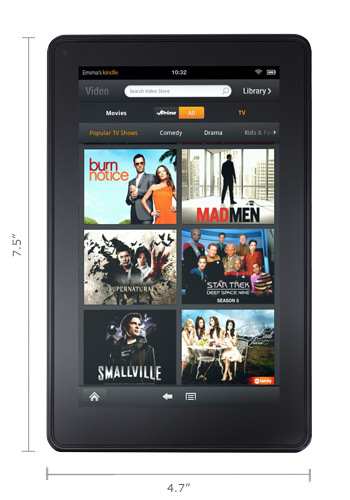 The Kindle Fire has sparked the greatest interest. It is a color tablet beautifully designed not only as an ebook reader but a web browser and multimedia viewer. The $199 price is very appealing in the increasingly crowded tablet market. I don’t think Amazon expects to compete with the iPad, but the Kindle Fire may have many of the essential features consumers are expecting from a tablet computer. Ultimately it doesn’t matter how great the hardware is if the books you want to read aren’t available for the device. I think this is where Amazon has pulled far ahead of the competition. Amazon currently has about 765,000 books available for the Kindle. Recently Kindle books have become available through public libraries. They are checked out just like physical books, typically for two weeks, and are no longer readable after the expiration date. Locally Kindle ebooks are available through the Lone Star Digital Library. Amazon has now made another feature available to Amazon Prime members. They call it the Kindle Owners’ Lending Library. It allows Amazon Prime members who own a Kindle device (applications for personal computers or tablet computers are not included) to borrow one book a month from a list of about 5000 titles. Unlike books borrowed from a library there is no time limit, but you can only have one book at a time. The titles are divided into categories and subcategories and can be browsed from the Kindle device. This feature is in addition to unlimited Netflix-like movie streaming and free 2 day shipping for Amazon Prime members. Maybe I should have titled this post It’s a Great Time to be an Amazon Prime Member! This entry was posted on November 12, 2011 at 12:15 pm and is filed under Books. You can follow any responses to this entry through the RSS 2.0 feed. You can leave a response, or trackback from your own site.